The Best Steam Cleaner Now Even Better! The Carmen Super Inox is now engineered to be The Most Powerful 110V steam vacuum cleaner on the market operating steam pressures at up to 105psi and vapor temperatures of up to 356ºF, anything less is simply not the best! The increased steam pressure and impressive steam temperature allows for up to 20% more cleaning efficiency, and opens the doors to more difficult tasks such as automotive detailing which require pressures of over 100psi. For Gum removal the 180ºC / 356ºF and 105 psi of pressure allows Dupray to offer you the most efficient 110V gum removal machine available. The larger boiler allows for prolonged high power usage, and ultimately maximizes the true potential of a standard north american electrical outlet. It's outstanding quality is visible from the robust fully stainless steel construction outside, this quality continues on the inside with only the highest quality components being used making the Carmen Super Inox the best steam cleaner available. Engineered with a built-in vacuum and detergent injection the Carmen Super Inox steam vacuum cleaner allows for completely self contained gum removal, degreasing, effortless grout cleaning, unmatched bedbugs extermination and various other previously impossible cleaning tasks. 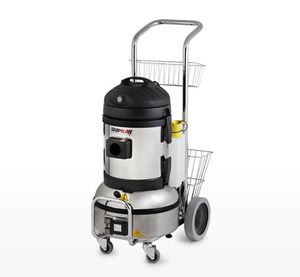 The Carmen Super Inox is certainly a large impressive steam vacuum cleaner but the great ingenuity in it's design is that the steam cleaner dismounts into 3 small compact pieces allowing the Carmen Super inox to be packed into smaller spaces, including the trunk of a Honda Civic, making this unit an incredible option for anyone. The Carmen Super Inox steam vacuum cleaner allows for up to 700* pieces of gum to be disintegrated, resulting in a complete removal like never seen before. This machine will astonish you at how gum dissolves before your eyes with unrivalled performance. It's integrated cart makes it extremely portable and easy for anyone to transport and operate. This commercial steam cleaner is built to last, it has all of the exceptionally important features you've come to expect from Dupray including a lifetime warranty on the boiler and a 3 year warranty on parts. The Carmen Super Inox Vapor Steam Vacuum Cleaner is a spectacular tool for auto detailing and steam car washes. The impressively high level of steam pressure enables steam to instantly dislodge the hardest to remove stubborn residues including; brakedust, carbon, engine oil, salt stains, diesel smoke and fuel. With the combination of either Over Heated Water Injection or Detergent Injection, the Carmen Super Inox is capable of rinsing away all of the dirt that has been loosened with steam, allowing for a quick and effective cleaning like never before seen. The Carmen Super Inox vapor cleaner is one of the only steam vacuum cleaners on the market to include integrated detergent injection, this feature allows for easy cleaning of extremely greasy and difficult areas with extreme ease. Dupray has developed special ecological commercial detergents that are designed to be able to be heated without emitting toxic gases and harmful odours. This commercial steam cleaner features a powerful vacuum with a succion capability of 2200mm water column lift, allowing the possibility to extract dirt and gums while steam cleaning. Dupray has ensured the Carmen Super Inox is fully built out of the highest quality stainless steel, creating a much stronger and durable machine. No corners were cut in providing you with the best equipment possible. The Stainless steel vacuum drum is integral in gum removal and its ease of use; preventing gum and dirt from sticking to the inside of the drum allowing for an easy clean up after use. The large 4L (1.1gal) boiler and 3L (0.8gal) water tank allow for over 2 hours of operating before having to refill the water, due to the innovative feature of continuous use, the steam cleaning machine is not pressurized, permitting the ability to fill the water tank while the equipment is still on, resulting in no downtime; saving you time and money. The Carmen Super Inox is one of the safest pieces of cleaning equipment to operate, Vapor Steam Cleaners produce dry steam with under 5% humidity which means that only within the first 6inchs of the exit point is the steam scalding, this greatly reduces the risk of burns, allowing for extremely safe operation for you and your employees. Save money while going green! The Carmen Super Inox vapor vacuum cleaner only needs basic tap water to be able to produce the powerful steam that allows for your cleaning applications, there is no greener solution than steam. With the Dupray steam cleaning systems you do not need harsh expensive chemicals, and our brushes cost a fraction of competitors reducing your operating costs to pennies! Replaceable Heating Elements:Save money with replacable elements; typical steam cleaners require the whole boiler to be replaced when a heating element loses it's efficiency after years of operation, replacing a steam cleaner's boiler is laborious and costs almost as much as a new steam cleaning machine. Tecnovap® Steam Cleaning machines are designed with simple twist out elements, allowing for a quick, easy and inexpensive replacement, effectively restoring your steam cleaner back to the same efficiency as it was when it was first delivered to you. Automatic refilling steam cleaners: allowing for not only continuous use but also a special technology that provides a constant water level, resulting in constant pressure and temperature, meaning a more consistent steam production. Self Cleaning boilers: Tecnovap® machines are designed with an electromagnetic float system to effectively clean scale, calcium and mineral build up from hard water sources, allowing you to use regular tap water. This action occurs thousands of times during your routine operation, resulting in next to no maintenance being required on the unit. This system only needs to be drained and rinsed out (a quick 60second procedure) every 50 hours of operation. Variable pressure control on the handle: One of the most crucial and useful technologies provided by the Tecnovap Carmen Super Inox is the variable steam pressure control integrated on the control handel, quickly allowing for easy use various steam pressures between minimum, medium and maximum, depending on the desired application. This is absolutely essential in some applications where no pressure is required, such as getting rid of bedbugs where just an exposure to the high temperature is needed to kill the bedbugs, in fact the use of higher pressure settings will blow away the bedbug infestation as opposing to eradicating it. The High pressure setting is always available for such applications that you must use higher pressures like degreasing kitchen equipment where the high pressures blow away the caked on grease and dirt buildup. Stainless steel body and boiler: The Carmen Super Inox is designed and built with quality, and durability in mind, this is the exact reason the steam cleaner is built with a fully stainless steel exterior to withstand years of commercial use. The Tecnovap boilers are built with the highest quality AISI 304 Stainless Steel implementing TIG welds, the same technology used in aircrafts, to provide you with the most dependable and safe steam cleaner boiler available today. No expense was spared in order to build the best steam cleaner possible. Do not be fooled by similar equipment, Dupray is the only one to offer you the highest quality in not only equipment but the best after sale service in North America. Dupray offers you Tecnovap® steam cleaners built in Italy, the original steam cleaner manufacturer with over 20 years of experience. Do not be fooled by cheaper equipment with less experience and service. Skip re-branding and middlemen Dupray Industries is the most direct to the Manufacturer you can get, resulting in quality service and equipment.